Our music editing department is creative and talented. Understanding your vision and translating it into the finished product is our specialty. There are many applications for this product at your celebration. The song starts to play, the guests are listening and your voice comes over the music edited in from a recorded message you came into our office and recorded before the event. Your personal message can be sentimental, romantic or fun - you choose! It can be done as a surprise or you can let people know its coming - it's all up to you. Contact our office and make the arrangements. Come in and record your personal message for your celebration. This takes some planning and organization to make happen, but the results are worth the effort. Parents to a Son/Daughter on a birthday. Son/Daughter to Parents on a birthday or anniversary. Husband to his Wife at their anniversary. Wife to her Husband at their anniversary. Message to a retiree from fellow colleagues at a retirement party. Message to a family member or members at a family reunion. Use your imagination - if you have an original idea, let us know and we can make it work for you! In order to make this a unique and memorable moment to cherish for the rest of your life - it should be done by a professional. We continue to produce new and creative ways to have personal messages delivered on special days. 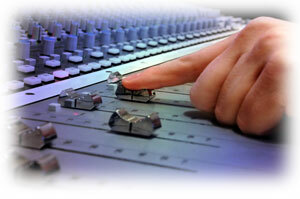 All of the recording, editing and mixing is done in advance leaving nothing to chance at the event. To hear samples of past messages or to begin planning your personal project - contact us for an appointment. We offer you another unique way to personalize your music. We will mix two or more or your favorite songs together, giving you something different and creative. Would you like to surprise your guests with an energetic alternative or perform a choreographed traditional dance? Anything is possible with our experienced staff. A popular variation includes starting with a slow song then cutting into an upbeat energetic song then finishing with the original song. Use your imagination and let us work with you creating a unique and memorable moment at your celebration.